PbNb2O6-xmol%Nb2O5 (PN-x=0, 5, 10, 15, 20) Piezoelectric ceramics were prepared by solid-state reaction method. The effects of excess Nb2O5 on the sintering and electrical properties of PbNb2O6 ceramics were investigated. The sintering and electrical properties were evidently improved after the addition of Nb2O5 into PN in the condition set for a high Tc and high coupling anisotropy. The improvement may originate from NbO6 octahedral distortion by excess Nb2O5, which prevents phase transition from rhombohedral to tetragonal during the sintering process. 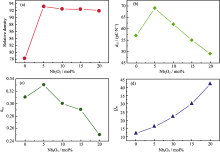 With excess addition of Nb2O5, the piezoelectric coefficient (d33) and relative density of PN ceramics increased and reached up to 69 pC/N and 93.1%, respectively, at 5mol% addition of Nb2O5. 夏标军, 周志勇, 董显林. 过量Nb2O5对偏铌酸铅压电陶瓷烧结性能和电学性能的影响[J]. 无机材料学报, 2018, 33(11): 1248-1252. Biao-Jun XIA, Zhi-Yong ZHOU, Xian-Lin DONG. Effect of Excessive Nb2O5 on the Sintering and Electrical Property of Lead Metaniobate Piezoelectric Ceramics[J]. Journal of Inorganic Materials, 2018, 33(11): 1248-1252. ZHANG SHU-JUN, EDARD F-ALBERTA, EITEL RICHARD-E, et al.Elastic, piezoelectric, and dielectric chararacterization of modified BiScO3-PbTiO3 ceramics.IEEE Transactions on Ultrasonics, Ferroelectrics and Frequency Control, 2005, 52(11): 2131-2139. WANG YUN-LI, CAI KAI, JING FENG, et al.Mn doped hard type perovskite high-temperature BYPT-PZN ternary piezoelectric ceramics.Sensors and Actuators A, 2014, 216(11): 335-341. 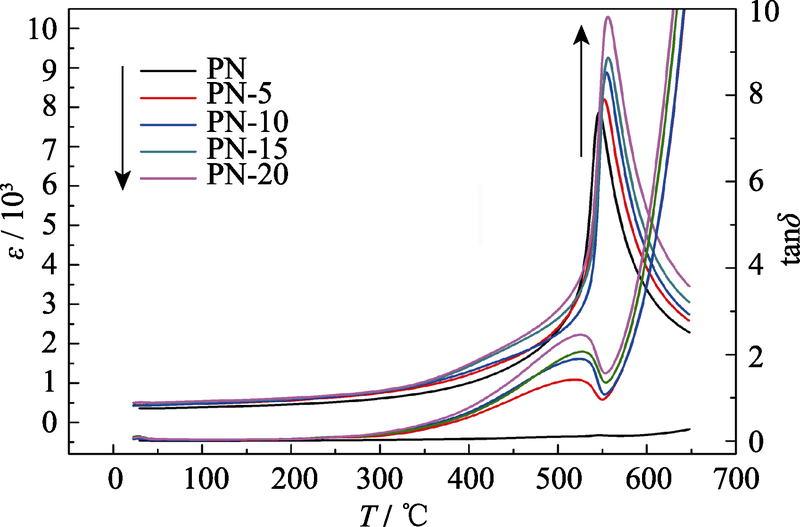 CHEN JIANG-GUO, ZHAO TIAN-LONG, CHENG JIN-RONG, et al.Enhanced piezoelectric performance of (0.98-x)Bi(Sc3/4In1/4)O3- xPbTiO3-0.02Pb(Zn1/3Nb2/3)O3 ternary high temperature piezoelectric ceramics.Journal of Applied Physics, 2013, 113(14): 144102-114103. CAI KAI, JIANG FENG, DENG PING-YE, et al.Enhanced ferroelectric phase stability and high temperature piezoelectricity in PN ceramics via multisite Co-doping.Journal of the American Ceramic Society, 2015, 98(10): 3165-3172. LEE HO-SUNG, KIMURA TOSHIO.Sintering behavior of metaniobate.Ferroelectrics, 1997, 196: 137-140. KINURA TOSHIO, KURADO YUKINORI, LEE HO-SUNG.Effect of phase transformation on the sintering of lead barium metaniobate solid solutions.Journal of the American Ceramic Society, 1996, 79(3): 609-612. LEE HO-SUNG, KIMURA TOSHIO.Effects of microstructure on the dielectric and piezoelectric properties of lead metaniobate.Journal of the American Ceramic Society, 1998, 81(12): 3228-3236. SUBBARAO E C.X-ray study of phase transition in ferroelectric PN and related materials.Journal of the American Ceramic Society, 1960, 43(9): 439-442. SOEJIMA JUNICHIRO, SATO KOKICHI, NAGATA KUNIHIRO.Preparation and characteristics of ultrasonics transducers for high temperatures using PN.Journal of Applied Physics, 2000, 39(5): 3083-3085. VENET M, VENDRAMINI A, ZABOTTO F L, et al.Piezoelectric properties of undoped and titanum or barium-doped lead metaobate ceramics.Journal of the European Ceramic Society, 2005, 25: 2443-2446. RAO K-SAMBASIVA, NATH N-VALLIS.Influence of rare-earth ion on piezoelectric and pyroelectric properties of PBN system.Ferroelectrics, 2005, 325: 15-24. CHEN XIAO-MING, MA HAI-YAN, DING WEI, et al.Microstructure, dielectric, and piezoelectric properties of Pb0.92Ba0.08Nb2O6-0.25wt% TiO2 ceramics: effect of sintering temperature.Journal of the American Ceramic Society, 2011, 94(10): 3364-3372. CHEN XIAO-MING, WANG JIAN, LIANG XIAO-XIA, et al.Crystallite structure, microstructure,dielectric, and piezoelectric properties of (Pb1.06-xBax)(Nb0.94Ti0.06)2O6 piezoelectric ceramics prepared using calcined powders with different phases.Materials Chemistry and Physics, 2014, 143: 1149-1157. ABRAHAMS S C, JAMIESON P B, BERNSTEIN J L.Ferroelectric tungsten bronze-type crystal structures. III. potassium lithium niobate K(6-x-y)Li(4+x)Nb(10+y)O30.The Journal of Chemical Physics, 1971, 54(6): 2355-2364. ROTH R S.Unit-cell data of the lead niobate PbNb2O6.Acta Crystallographica, 1957, 10: 437. HIROSHIMA TAKUYA, TANAKA KAZUHIKO, KIMURA TOSHIO.Effects of microstructure and composition on the Curie temperature of lead narium niobate solid solutions.Journal of the American Ceramic Society, 1996, 79(12): 3235-3242. LIMA-SILVA J J, GARCIA D, FILHO J M, et al. The ferro-paraelectric phase transition of Pb0.6Ba0.4Nb2O6 investigated by Raman scattering.Physica Status Solidi (b), 2004, 241(8): 2001-2006. SINY I G, LUSHNIKOV S G, SINY S I, et al.Light scattering from (K0.5Na0.5)0.2(Sr0.75Ba0.25)0.9Nb2O6 with the tungsten bronze structure: an analogy with relaxor ferroelectrics.Journal of Applied Physics, 2001, 89: 1671-1678. 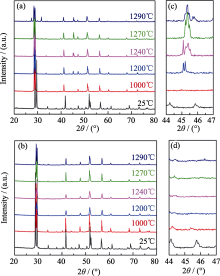 AMIRA Y, GAGOU Y, MENNY A, et al.Structural and Raman properties of the tetragonal tungsten bronze ferroelectric Pb2(1-x)K1+xGdxNb5O15.Solid State Communications, 2010, 150: 419-423. BOUZIANE M, TAIBI M, SAVIOT L, et al.Raman characterization of Pb2Na1-xLaxNb5-xFexO15 and Pb0.5(5-x)LaxNb5-xFexO15 (0<x<1) solid solutions.Physica B, 2011, 406: 4257-4260. ZHU XIAO-LI, CHEN XIANG-MING,LIU XIA QI. Ferroelectric phase transition and low-temperature structure fluctuations in Ba4Nd2Ti4Nb6O30 tungsten bronze ceramics. Journal of Applied Physics, 2009, 105(12): 124110-1-6. WILDE RICHARD-E, Raman spectrum of Sr0.61Ba0.39Nb2O6.Journal of Raman Spectroscopy, 1991, 22: 31-35. FARIA J L B, FREIRE P T C, AYALA A P, et al. Low-temperature raman spectra of Sr0.66Ba0.34Nb2O6 single-cystal fibers.Journal of Raman Spectroscopy, 2003, 34: 826-830. DAVID C, TUNYAGI A, BETZLER K, et al.Compositional dependence of optical and vibrational properties of strontium barium niobate (SrxBa1-xNb2O6).Physica Status Solidi (b), 2007, 244(6): 2127-2137. XIA H R, YU H, YANG H, et al.Raman and infrared reflectivity spectra of potassium lithium niobate single crystals.Physical Review B, 1997, 55: 14892-14898. 周志勇, 陈涛, 董显林. 超高居里温度钙钛矿层状结构压电陶瓷研究进展[J]. 无机材料学报, 2018, 33(3): 251-258. 赵林, 马健, 张俊, 吴波, 肖定全. (1-x)K0.48Na0.52NbO3-xBi0.45Nd0.05(Na0.92Li0.08)0.5ZrO3无铅压电陶瓷相结构及压电性能[J]. 无机材料学报, 2018, 33(1): 87-92. 龙佩青, 刘希涛, 易志国. 制备工艺对(Ba0.85Ca0.15)(Ti0.9Zr0.1)O3无铅压电陶瓷结构与性能的影响[J]. 无机材料学报, 2017, 32(3): 299-304. 龙廉骏, 徐建梅, 公衍生, 武明阳, 崔新友. 微波烧结对PLZT陶瓷电学性能的影响[J]. 无机材料学报, 2015, 30(5): 500-504. 刘颖, 赖发春, 黄志高, 沈东全, 龙西法. 新型铁电固溶体铌镥酸铅-铌镁酸铅-钛酸铅的制备与表征[J]. 无机材料学报, 2014, 29(9): 912-916. 孙海勤, 张涛, 张奇伟, 张胤. (Bi0.5Na0.5)TiO3:Sm3+无铅压电陶瓷的红光发射特性[J]. 无机材料学报, 2014, 29(8): 851-854. 张发强, 李永祥. 铋层状结构铁电体的研究进展[J]. 无机材料学报, 2014, 29(5): 449-460. 王 轲, 沈宗洋, 张波萍, 李敬锋. 铌酸钾钠基无铅压电陶瓷的现状、机遇与挑战[J]. 无机材料学报, 2014, 29(1): 13-22. 张志强, 刘志甫, 李永祥. 0.84(K0.48Na0.52)NbO3-0.16K0.56Li0.38NbO2.97无铅压电陶瓷的多层膜工艺研究[J]. 无机材料学报, 2014, 29(1): 23-27. 王大伟, 赵全亮, 曹茂盛, 崔 岩, ZHANG Shu-Jun. Sn含量对PbSnO3-Pb(Mg1/3Nb2/3)O3-PbTiO3三元系压电陶瓷相结构和电性能的影响[J]. 无机材料学报, 2014, 29(1): 28-32. 江向平, 李 璐, 陈 超, 唐 洁, 郑凯平, 李小红. 高压电常数(Ba0.85Ca0.15)(Ti0.9Zr0.1-xSnx)O3陶瓷结构与性能研究[J]. 无机材料学报, 2014, 29(1): 33-37. 褚 涛, 艾辽东, 龙西法. 铌钽酸钠钾锂-铟酸铋铁电压电性能的研究[J]. 无机材料学报, 2014, 29(1): 43-46. 刘 颖, 龙西法. 新型铁电晶体铌镥酸铅-钛酸铅的生长与性能[J]. 无机材料学报, 2014, 29(1): 47-51. 刘岩,黄政仁,董绍明,江东亮. 表面处理对碳化硅泡沫陶瓷挂浆性能的影响[J]. 无机材料学报, 2006, 21(5): 1185 -1190 . 迟玉山,沈菊云,陈学贤. 硬盘基板用微晶玻璃的析晶过程研究[J]. 无机材料学报, 2001, 16(5): 791 -796 . 刘卫平,余庆选,田宇全,廖源,王冠中,方容川. 硼掺杂对金刚石薄膜生长特性的影响[J]. 无机材料学报, 2005, 20(5): 1270 -1274 . 马建华,孟祥建,孙璟兰,褚君浩. MOD法制备的Bi3.25Nd0.75Ti3O12薄膜的铁电各向异性行为[J]. 无机材料学报, 2005, 20(2): 430 -434 . 李敬锋,杉木真也,田中秀治,江刺正喜. 反应烧结Si3N4陶瓷微型转子的制备[J]. 无机材料学报, 2003, 18(5): 1081 -1085 . 袁峰,王红洁,金志浩. 碳毡中SiC纳米线的制备[J]. 无机材料学报, 2007, 22(3): 418 -422 . 任光明,袁松柳,缪菊红,余功奇,肖 循,尹诗岩. La0.67Ca0.33MnO3/MgO复合体系中的电输运和磁电阻效应[J]. 无机材料学报, 2007, 22(4): 715 -719 . 魏雄邦,吴志明,王涛,蒋亚东. 氧化钒薄膜在玻璃基片上的生长研究[J]. 无机材料学报, 2008, 23(2): 364 -368 . 刘明贤,孙颖,甘礼华,王京红,徐子颉,陈龙武. 静电自组装制备CdTe量子点纳米薄膜[J]. 无机材料学报, 2008, 23(3): 557 -561 . 陈大任,李国荣,殷庆瑞. 逆压电效应的压电常数和压电陶瓷微位移驱动器[J]. 无机材料学报, 1997, 12(6): 861 -866 .